NOTE: You can save a kilometer by starting directly at the park instead of in Haight-Ashbury. Or cut the route in half by turning around before Crossover Drive, circling south around Stow Lake and then head home from there. Pictures courtesy of the creative folks at Flickr Creative Commons. Thanks! If you're in San Francisco, here's a route that will help you escape the city's pulsing urban bustle. 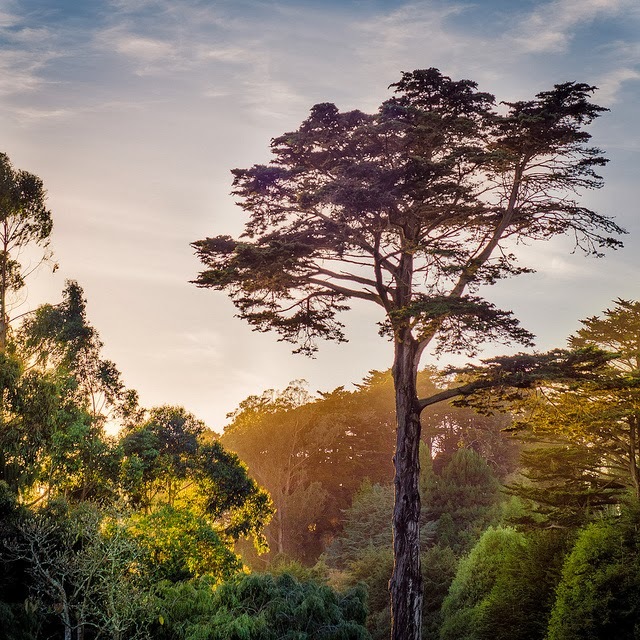 You'll suddenly find yourself enclosed in a wide swath of nature: in Golden Gate Park. The park is a gigantic green rectangle cutting across the western half of the San Francisco peninsula, from the Pacific coast to Haight-Ashbury. It's bigger than New York's Central Park, with over 1,000 acres, being almost 5-km wide and 1-km high. 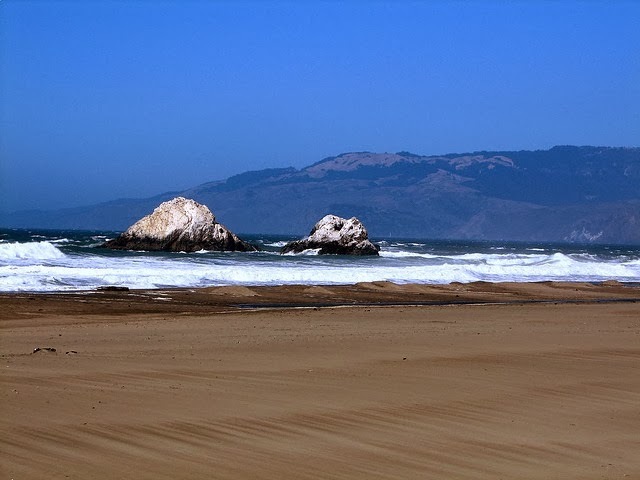 The area was once considered wasteland, covered by rolling sand dunes. 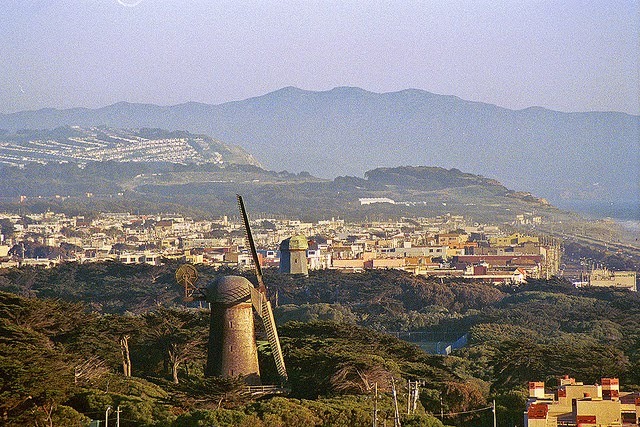 Now, Golden Gate Park is home to a wide variety of fun and scenic stuff: athletic fields, lakes, museums, gardens, a bison herd, windmills, woods and playgrounds, with a stretch of beach and its wild surf along the western, Pacific Ocean end. And the occasional glimpse of Twin Peaks rising over the southern horizon remind you of further running adventures to be had in this part of the city. Unfortunately, there are a few roads running both lengthwise and crosswise through the park. Originally, it was planned to lower the streets into trenches, as done in Central Park, to keep down the noise and make it easier for pedestrians to move about. But that never happened. The main north/south road, Crossover Drive, is pretty busy. But, luckily, the others aren't normally too noisy, so you can run along them without too much disturbance. 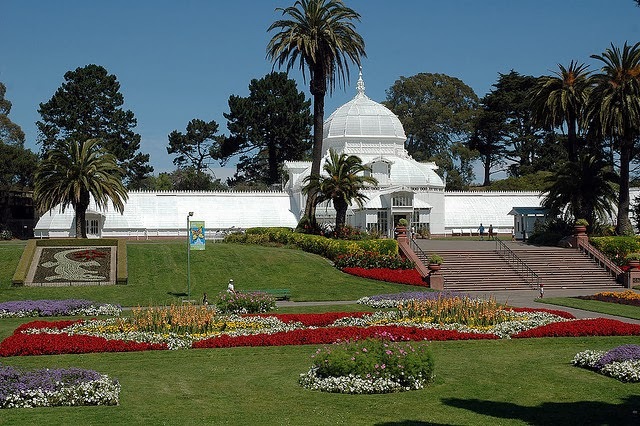 This route will start at the famous corner of Haight and Ashbury, then head west through the Panhandle Park to Golden Gate Park, and then loop counterclockwise through the park to the beach, then back east through the south end of the park and then along Haight Street. The route mainly follows the east/west roads in the park (John F. Kennedy Drive along the north side and Martin Luther King Jr. Drive along the south). There are other trails in places, off the roads, but to follow them takes a lot of zig-zagging. You might want to try other trails later, with this route giving you a good overview of the park first. So, if you're ready to head out, here we go! 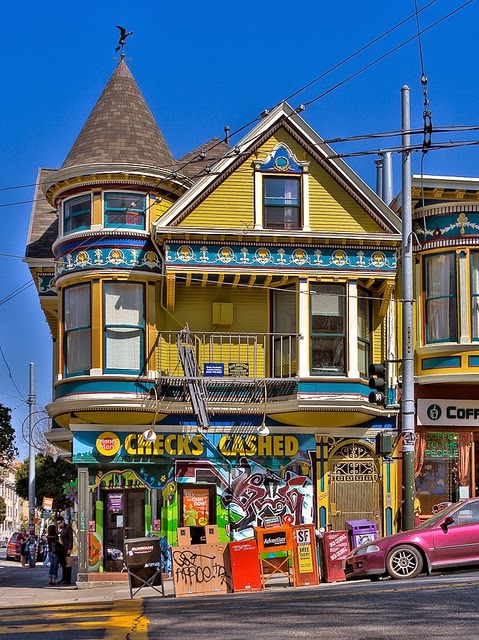 At the corner of Haight Street and Ashbury Street, take a look around. This was the center of the flower-power universe in the late 1960s. It's a bit touristy now, but still laid-back and scenic. Now turn north on Ashbury and run the two blocks to the narrow Panhandle Park. In the park, turn left and follow Oak Street along the park path, heading west. After three blocks, a few streets will criss-cross as they join together at Stanyan Street, forming John F. Kennedy Drive. Just stay on the right side and run straight into Golden Gate Park. You'll go by the park headquarters building on the right and just continue on the sidewalk next to the JKF Drive. There will be tennis courts along the left side, then the beautiful Flower Conservatory greenhouse building on the right, just after the 1-km mark. Just 200 meters past the Conservatory, you'll see the green sign for the Rhododendron Garden and the wicker fences on the left side. Now cross the street to the Rhododendron Garden and follow the trail down through the big courtyard with the bandstand located between the two museums, at the 2-km mark. This is the "Music Concourse". The Academy of Sciences museum is on the left, just one story tall, with a lawn on its roof. 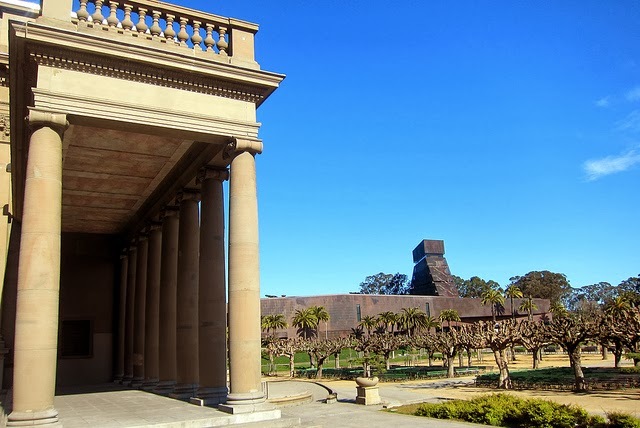 On the right side is the dark, modernistic bunker of De Young Art Museum. 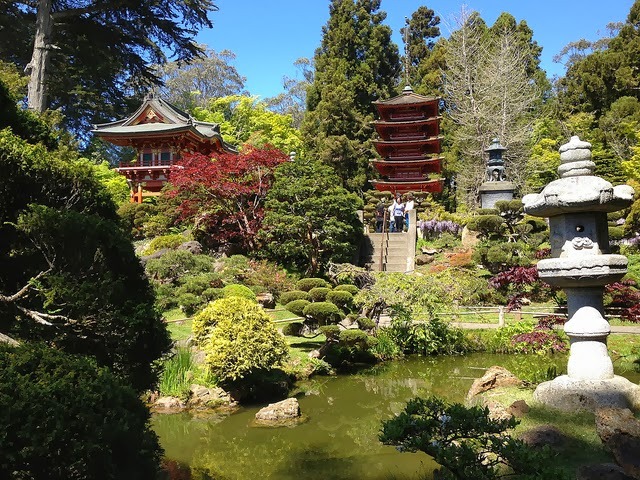 Run past the Japanese Tea Garden on the right side, then take the first path to the right to head northwest towards the north shore of Stow Lake. NOTE: The Tea Garden normally costs admission, but if you get there before 10 AM on Monday, Wednesday or Friday, it's free, so you could loop through this beautiful oasis, if you wish, with its ponds, pagodas and flower. Now run west along the north shore of Stow Lake, going by the big hill island in the middle of the lake, with its waterfalls. You'll then pass the big boat house, where paddle-boats are rented. After Stow Lake, you'll start going downhill for the rest of the way to the beach. You'll come back to JFK Drive just before it goes under the north/south overpass of Crossover Drive (the biggest, loudest street in the park, with six lanes), and continue westwards running along the north side of JFK Drive. You'll run past Lloyd Lake and then, a kilometer later, Spreckels Lake, where a little waterfalls comes right down to the sidewalk. Right after Spreckels Lake, at the 5-km mark, you'll come to the Bison Paddock, with its herd of buffalo. After the Bison Paddock, you'll pass the golf course and then JFK Drive turns northwest and goes through the last part of the park. Just before you leave the park, you'll see the Dutch Windmill along the right side. You can follow its driveway to loop past the mill and back out to the street again. This was one of two 100-year-old windmills built to pump water into the park lakes for irrigation. JFK Drive will then end as it runs into the Great Highway, lining the Pacific coast, with the wide sands of the Pacific beach stretching out in front of the crashing waves. Cross the highway at the cross-walk and run out onto the beach, where you turn left to run south. Run for less than a kilometer, until you get to the cement outlook structure in the sand, where you turn inland again at Lincoln Way, which runs along the south edge of the park. This is the 7.5-km mark. There is a footpath running parallel to Lincoln Way. Follow that path. You will go by Murphy's Windmill, the other windmill, which was recently totally rebuilt. Now it's a gradual uphill run on the return trail. Follow the path as it joins in with Martin Luther King Drive, just inside the south edge of the park. You'll now just basically run along the sidewalk beside this street all the way through the park, heading east. At the 10.5-km mark, you'll go under the Crossover Drive again. You will soon be running by the Botanical Garden along the right side, as the road circles around it to the north. NOTE: If you get there between 7:30 and 9 AM, admission to the Botanical Garden is free, so take an extra loop through this beautiful garden with its ancient trees and bamboo woods! You'll also go by the southern edge of Stow Lake on the other side of the street. At the main entrance to the Botanical Garden, just before getting back to Lincoln Way, turn left to stay on Martin Luther King Jr. Drive, with baseball fields off to the left. Martin Luther King Jr. Drive ends when it runs into Kezar Drive, where you turn left to continue running eastwards. Stay on the north side of Kezar Drive, going by the creatively done playground on the left side, and the stadium where the 49ers used to play on the right side. Most of the seating in Kezar Stadium has been removed, and now it's used by high schools. After Kezar Drive makes a sharp left turn, run down through the underpass under Kezar Drive at Alvord Lake, continuing eastwards through the last bit of the park. Exit the park to cross Stanyan Street and run east along Haight Street, at the McDonald's, along with a parking lot and other signs of advanced civilization. But soon you'll be running by relics harking back to the flower-power days, like the Amoeba Music shop. The street has retained a lot of hippie charm despite the fact that it's now aimed at tourists. I hope you enjoyed this pleasant side of San Francisco! Amoeba opened its store on Haight St in 1997 in a former bowling alley. Neither this store, nor their circa 1990 Berkeley store really qualify as relics of the flower-power days. Sorry for the bad map link. I fixed it now: just click on the "Click here for route map" headline over the route. Have a great time running in San Francisco!